Where does the North begin? Does history solely concern human history? Who is indigenous? These are just a few of the questions and thoughts that came up at the Northern Nations Northern Natures workshop held in Stockholm November 9-11th. With my natural science background, I was out of my comfort zone at times during the workshop, learning about border poetics, boxes as transformative objects and bottled icebergs. But isn’t that after all the best place to be? As unsettling at it can get, isn’t this discomfort necessary in order to gain perspective, to trigger new thoughts, to start thinking outside the (muskox) box and cross the borders of our own discipline? Throughout my doctoral research, I have often found myself outside of my comfort zone. My research looks at the interactions between Inuit and their forested environment in Nunatsiavut (northern Labrador). Through the lens of historical ecology, I attempted to obtain and work with diverse methodologies and sets of data  in order to link forest ecology to historical patterns of forest use and current Inuit ecological knowledge. Interdisciplinary research approaches are challenging as they require a great amount of work and time to become familiar with diverse disciplines, their theories, specific languages and methodologies. It is easy to make mistakes when employing the diversity of methodological approaches required to explore topics from working with environmental proxies to Inuit ontologies. Also, there is a danger of remaining too superficial in the analysis, or worse, denaturing different types of knowledge to fit them in a research paradigm. However, the demanding (and sometimes frustrating) interdisciplinary research framework offers great opportunities in the study of landscapes, as they are products and archives of both environmental conditions and human activities. Through my research and travels, I have started to understand that similar landscapes and environments can be lived and interpreted in diverse ways by different peoples. Forested landscapes, which I examine in my doctoral research, invoke very different feelings and ideas for Inuit than for southern Canadians (and more southerly indigenous peoples). If many southerners consider the forest as a place of relaxation, healing and leisure, Inuit have a much more ambivalent relation with forested landscapes. Trees, although considered as useful resources, make transport difficult, block the horizon and landmarks and hide potentially dangerous creatures (see Kaplan 2012). In my presentation, I discussed how Labrador Inuit adapted to this “southern”  landscape by integrating forest resources into their land use, which in turn had considerable impacts on the local forest stands. 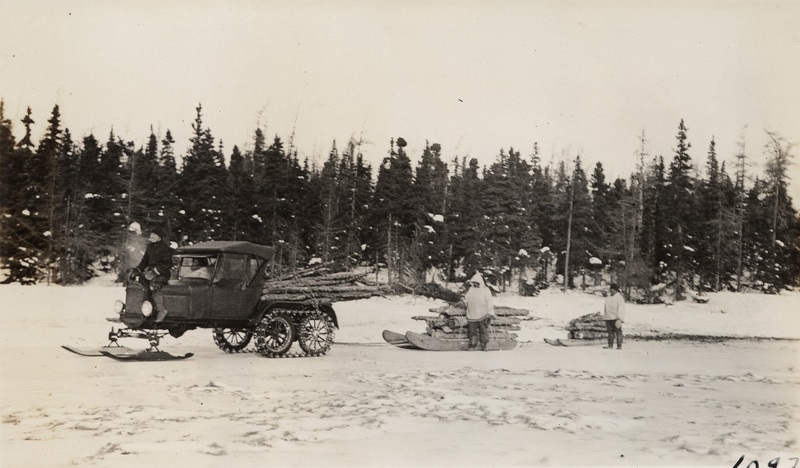 Snowmobile hauling wood to camp, 1924-1937, Labrador. Photographer: Donald Baxter Macmillan. Photo reproduced with the permission of Peary-Macmillan Arctic Museum (Bowdoin College, Brunswick, Maine, USA). Cold and snow, prominent features of northern landscapes, are also perceived and lived very differently in different places. In Nain, the northernmost community of Nunatsiavut, the first snowfall is a blessing. For Nainimiut (residents of Nain), the whirring of a snowmobile engine is the sweet sound of freedom. Then, in March-April, people cross their fingers and hope for the snow and ice to stay as long as possible: “Hope the weather stays cold!” is among the things you can hear at the co-op, while shopping for tea, canned milk and other goodies to take along on a trip to the cabin. I grew up in Montreal, a relatively northern city with a cold winter climate and good amount of snow and I swear I have never heard such statement there. The first snowfall brings sighs rather than joy, as it announces never-ending traffic jams, dangerously icy spiral staircases and more importantly, the end of the terrace season. Except for kids, of course, who see in the white powder a myriad of opportunities. I was reflecting on those thoughts while in Stockholm, trying to perceive differences and similarities between the ways residents of a large Scandinavian city embraced their northern identity, in comparison to those of a large Canadian city. I was impressed and touched by the beauty of tea lights in the streets that are said to be associated to the tradition of All Hallow’s Eve and persisted through time. I liked to think that this was some kind of northern adaptation, to enliven the 3pm darkness on one side, but maybe also to celebrate the arrival of winter, season during which “nordicity” culminates. 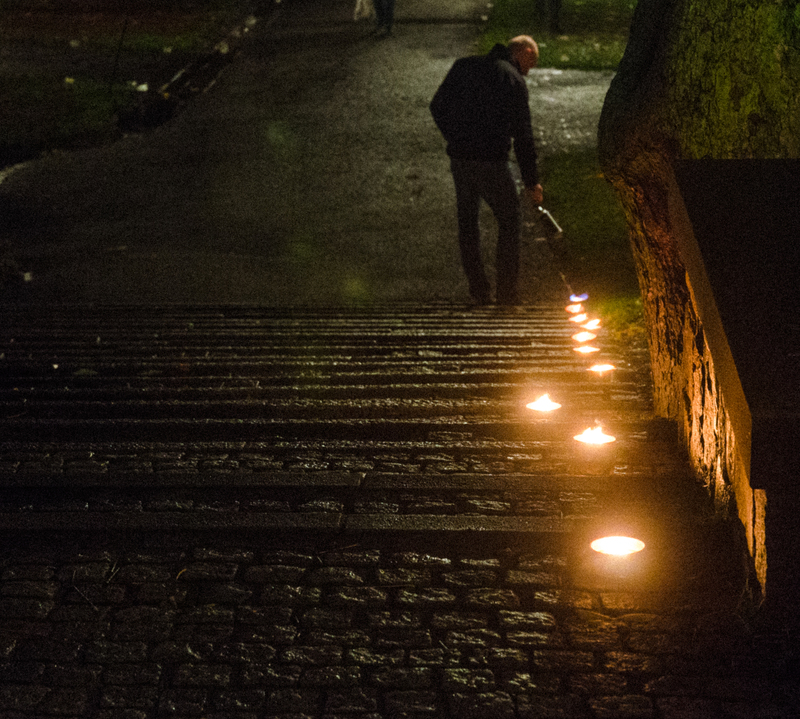 Man lighting tea lights, “bringing light to darkness”, downtown Stockholm. Photo credits: Jonathan Luedee. I don’t know if the question “where does the North begin” can or should be answered. Maybe the North is just not something that can be put into a box. But, as Tina Loo pointed out, perhaps we could reflect further on northern environments not as distant, foreign and harsh places, but more as our homelands. Looking at how we, northern peoples, have shaped, interacted with and adapted to our landscapes, how we connect and relate to our own nordicité, could provide interesting avenues for transnational and interdisciplinary studies of northern environments. The Northern Nations, Northern Natures workshop certainly allowed good exchanges of perspectives across borders and disciplines. I want to sincerely thank Tina Adcock and Peder Roberts for organising it and NiCHE for their support. I returned to Québec City with new questions and ideas in mind, along with major jetlag and a persistent mental soundtrack of ABBA greatest hits. Hamelin, L.-H. (1975). Nordicité canadienne. Vol. 55. LaSalle, Québec: Hurtubise HMH, 1980. Kaplan, S. (2012). Labrador Inuit Ingenuity and Resourcefulness: Adapting to a Complex Environmental, Social and Spiritual Environment, in David Natcher, Lawrence Felt and Andrea Procter (eds), Settlement, subsistence and change among the Labrador Inuit, Winnipeg, University of Manitoba Press: 15-42. Labrador Inuit are amongst the few Inuit groups living south of the tree line. Hamelin perhaps thought words would help to define and relate to our nordicité, as he also invented 600 neologisms to describe northern environments in other words than those of the South. This post was originally published on The Otter/La Loutre. This entry was posted in Workshop reflections on December 31, 2013 by cmadcock84.